Hackaday reader [Tom Price] often uses Skype to communicate with family near and far, but he was getting tired of adjusting his webcam each time his kids moved out of frame. While the solution he came up with isn’t fully automated, it is hands-free, which is good enough for his purposes. [Tom] was looking around for an electronic foot pedal of some sort when he came across a wireless 3rd party Guitar Hero peripheral that happened to fit the bill. Using an Arduino library created by [Bill Porter], he was quickly able to get the toy to communicate with an Arduino-flashed Atmega8, but things kind of fell flat when it came time to relay signals back to his computer. 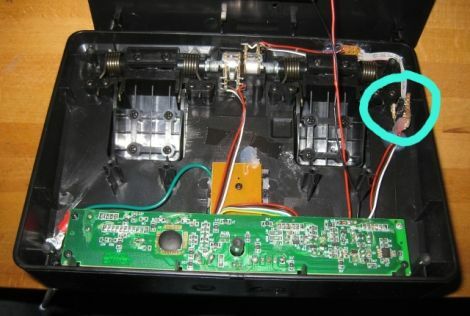 Using another Atmega8 along with the PS2X library, he was able to emulate the Guitar Hero controller that his foot pedal was looking for. With the pedal portion of his project wrapped up, he focused on his webcam. [Tom] mounted the camera on a small servo, which he then wired up to the receiving end of his foot pedal rig. As you can see in the video below, he can now pan his camera across the room with a tap of his foot, rather than leaning in and manually adjusting it. [Nick Johnson] recently wrote in, sharing a neat project he put together in his spare time. Our readers are most likely familiar with the ubiquitous “fortune” program that ships with many *nix distros, offering cheeky comments and quotes with the press of a button. [Nick] thought it would be cool to build a fortune telling machine using the app, resulting in the handsome device you see above. The laser-cut wooden case is home to a Raspberry Pi which does the heavy lifting, a coin acceptor, an LCD screen for displaying the device’s status, along with a SparkFun thermal printer. Upon feeding the machine some money, the user can press the “Advise Me” button, prompting the RaspPi to present a printed fortune from its vast database of sayings. [Nick] took some time to do some rough categorization of the fortune databases, enabling the machine to offer more substantial content as the user inputs more coins. Check out the video below to see [Nick’s] fortune telling machine in action. Tetris is unquestionably a game for the ages. Despite its simplicity, someone, somewhere will always find a way to port the game (Translation) to just about any electronic device that can handle it. Earlier this year we showed you a slick MIDI sequencer project that was constructed using an Arduino Mega, which also happened to drive an incredibly detailed touch screen display. 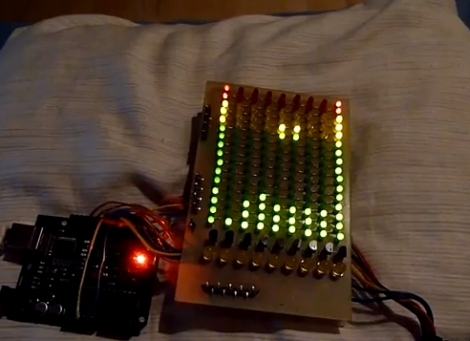 [Christian] must have gotten bored with his awesome creation one day, because he pulled the drum level display out of his Arduino Sequencer 808, and turned the LED array into a mini Tetris game. As you can see in the video below, the game runs pretty well, though from what we can see it lacks any sort of score keeping. We dig it because we never really tire of Tetris clones, and we think it’s great that he kept his 808 sequencer design modular enough that he can pluck different components out for reuse in other projects. Hackaday reader [JumperOne] was in need of a logic probe that he could use to reliably test some tiny .5mm pitch IC pins. The probe that came with his oscilloscope was a bit too big and not near sharp enough to do the job, but he figured that a syringe might do the trick nicely. He drilled a small hole near the business end of the syringe, through which he fed a piece of stripped twisted pair cabling. [JumperOne] then soldered a pair of pins to a small piece of coaxial cable, attaching the opposite end to the twisted pair already in the syringe. After carefully coiling the thin cable around the needle, he secured the coaxial cable and its pins in place with a bit of hot glue. [JumperOne] says that his makeshift logic probe works very well and the sharp needle would easily pierce through any oxidation or solder mask that stands in its way. One extra benefit of using a syringe as a probe is that they come complete with caps which help protect both ends of the delicate tool. [Tim] drives a 1995 Mitsubishi TS Magna, which is equipped with a less than stellar accessory package he lovingly calls a “poverty pack”. He outfitted his ride with an aftermarket head unit that can support the Bluetooth A2DP profile, provided he buys the ridiculously overpriced kit sold by Pioneer. Reluctant to shell out more money on an audio kit than his car is worth, he whipped up his own Bluetooth kit for far less than Pioneer’s asking price. 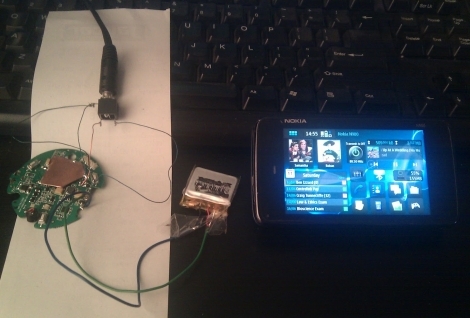 He had a set of Nokia Bluetooth headphones that he was willing to part with, so he disassembled them to see how he might interface with his car stereo. Connecting the headset to his head unit was a relatively easy task, but he had to work a bit harder to get his Bluetooth receiver powered properly. After both undervolting and then nearly cooking his wireless audio rig, [Tim] managed to get things operating to his liking. He says that the audio is a touch quieter than he would like at the moment, so he will likely be revising his design in the near future. For now however, he can stream tunes from his phone while he cruises around town. 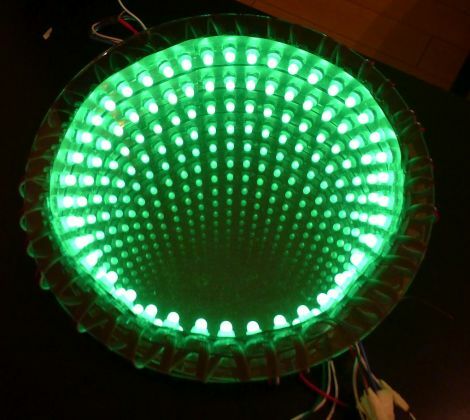 [Jeremy Zunker] from 10bitworks recently wrote in to share a cool build the group put together for the Luminaria 2012 festival which took place in March of this year. As you might have guessed, the fest is home to a wide array of light-themed projects, so the team at 10bitworks thought long and hard to come up with a design which would help them stand out from the other 79 featured artists. At the core of their project is a t-shirt which features a deep-sea diver surrounded by swarm of jellyfish. 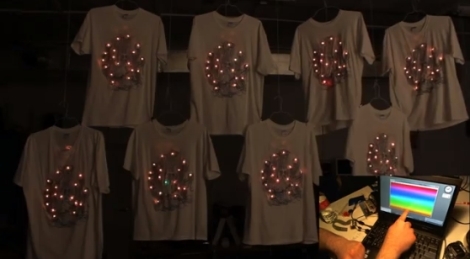 Each of the jellyfish is backlit by an LED module, allowing the group to create intricate light patterns on the shirt. 10bitworks brought 8 shirts to the show, each fitted with a small control pack that contained a set of batteries and a Jeenode wireless board. A ninth Jeenode and a large antenna were used as the master control unit, sending signals to each of the t-shirts in order to synchronize the light display. The final result turned out very nicely as you can see in the video below, where [Jeremy] walks through all of the project’s finer details.